Last week we took a budding art collector to a favorite Chelsea gallery, Berry Campbell, to answer some of the collector's questions about quality and pricing in the art world. 1. Dan Christensen's "Dolby" from 1998 [pictured above]. The reason this piece is hanging on a wall facing passers by is because it's gorgeous; it lures people into the gallery to ask questions and see more. And, like an attractive person who is ALSO smart and funny, the history behind this makes it even better: Dan Christensen was an American Abstract Expressionist painter who painted with anything but a paintbrush. Here, he used brooms and turkey basters around a spray-gunned core of neon pink and matte black. Note that this happened 50 years before graffiti art was a thing, and the sprayed center is perfect. Syd Solomon's Coastance, 1977, Acrylic and aerosol enamel on canvas, 36 x 48 in. 2. 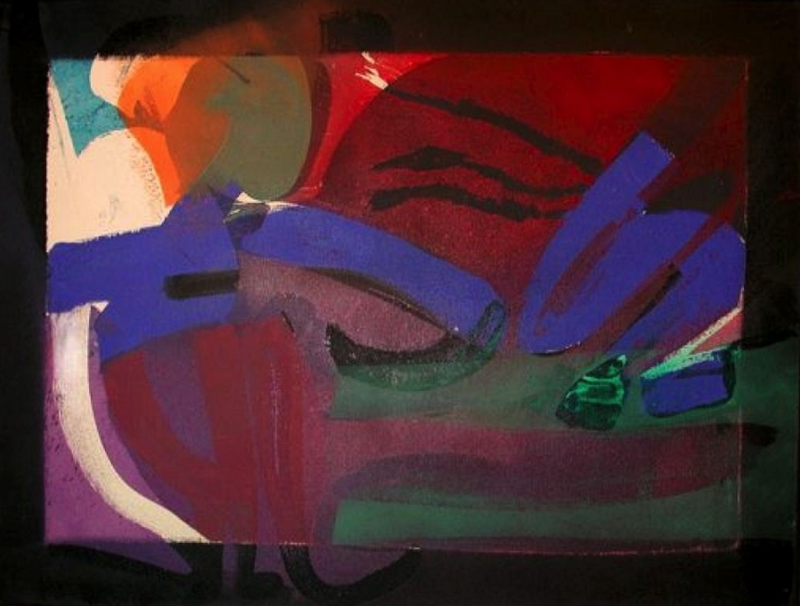 Moving on, Syd Solomon is another late 20th century abstract painter, and he hung out with a lot of the other big name artists of the time (Frank Kline, Jackson Pollock, etc). However, Syd Solomon didn't live in NY with his buddies -- he got frost bite serving in World War II and had to move to Florida (with its warm climate)--thus he wasn't AS famous, but his undervalued work is now being properly shown to the world and his market is strengthening accordingly. Relatedly, in World War II, Solomon actually designed camouflage for the army, and so much of his painting is obviously influenced by this experience with the organic layered forms. Susan Vecsey, Untitled (Cobalt/Silver), 2016, Oil on linen, 60 x 58 in. 3. Susan Vecsey's paintings sell like hot cakes, likely because they're pretty, quiet, non offensive and not boring. In fact, I could stare at this one for a while. The shade of blue, the subtle ombré effect of the gray, and that ghosted circle all lure me in. These paintings are not simple to execute: it takes 2+ months to create (though Vecsey works on a few at a time) because paint is strategically poured layer after layer onto the canvas. Each must dry before the next is applied, and the drying process can take over 24 hrs. Importantly, the most simple looking artworks are anything but simple to execute. That's a wrap for today's recap. Contact us for questions about any of these works or others. AND we're taking suggestions for future posts: what interests you most? Art market pricing? Quality? Our top galleries? Let us know!